The composer of the Salve Regina is uncertain. Some historians give credit to a man named Herman Contractus and others give credit to Adhémar, Bishop of Puy-en-Velay, and others to St Bernard. Adhémar was the first one to ask permission to go on a crusade and the first to receive the Cross from Pope Urban II. Whoever actually did compose the song must be enjoying his eternity knowing that many millions of times his song has been sung, and, likewise, many millions of people have been rewarded for the honor given to Our Lady. Since a prayer never goes unanswered and since the song is a beautiful prayer, imagine how many graces and benefits our world has been blessed with for what one composer did! 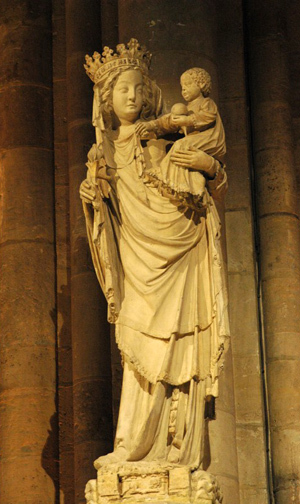 Before he left on the Crusade, Bishop Adhemar de Puy composed the war-song of the Crusade in which he asked the intercession of the Queen of Heaven for victory and protection (Migne, Dictionnaire des Croisades, S.V. Adhemar). Many Orders - Dominicans, Carthusians, Cistercians and others - began to use the song in their daily devotions and processions, and always for the great feasts of Our Lady’s privileges. By the 1500’s, Luther was complaining that the anthem was sung everywhere in the world and that the great bells were rung in its honor. He objected especially to the words "Queen of mercy, our life, our sweetness and our hope" (Catholic Encyclopedia). One has to wonder how anyone could be uncomfortable with such an endearing invocation to the Woman chosen by God himself to be His Mother and ours. It’s something to ponder. Our Lady’s privileges can be remembered and extolled in the Litany of Our Lady - a precious prayer to honor the special gifts given to the Blessed Mother. Singing the Litany and the Salve Regina is a wonderful way to celebrate the great feasts of Our Lady, such as the Nativity of the Blessed Virgin Mary on the 8th of September. In fact, wouldn’t it be wonderful to sing the Salve Regina with our families after the evening Rosary and let our homes and the world resound with that beautiful sung prayer once again?